The MA in General Psychology is a 30-credit program that provides students with a basic education in psychology and is a prerequisite for more specialized work leading to the PhD degree. Students take courses covering a wide range of the literature, including cognitive, social, developmental, and abnormal psychology, neuroscience, research methods, and statistics. Entering students work with an individual faculty advisor. This advisor, together with the departmental student advisor, introduces them to the curriculum as a whole and helps them to formulate the program that best suits their interests and needs. Students have access to a wide range of courses across The New School for Social Research to satisfy the elective requirements beyond the core required courses in general psychology. Students in the MA program have the option to pursue a concentration in Mental Health and Substance Abuse Counseling, which satisfies the academic requirements to later qualify as a licensed substance abuse counselor. A full account of degree requirements and procedures is contained in the Psychology departmental handbook. To earn the MA in General Psychology, a student must complete a total of 30 credits with a minimum grade point average of 3.0. A written master's thesis is not required, unless a student is applying to PhD studies in Psychology at NSSR. Students who intend to go on to a PhD program must demonstrate knowledge of elementary statistics, either by passing an exemption examination or by passing the basic statistics course. A maximum of three graduate credits taken at another university may be granted toward the credit requirement for the master's degree. Twenty-seven credits must be completed at The New School for Social Research. This program gives students planning to apply for PhD studies an intensive research experience working one-on-one with a member of the faculty. A student can apply for the Research Track after finishing at least 18 credits but not more than 24 credits. Applicants must have at least a 3.7 GPA if applying to the PhD in Cognitive, Social and Developmental Psychology, or a 3.5 if applying to the PhD in Clinical Psychology. Prospective PhD students must maintain this average until completion of the MA. 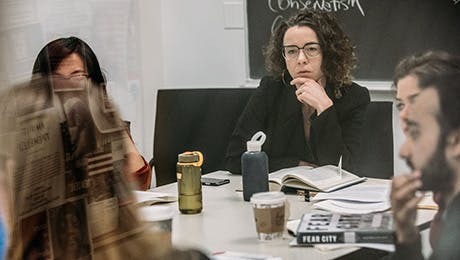 Each student works closely with an individual faculty member on an empirical research project, writes an MA thesis based on the project, and defends the thesis in an oral examination. Research track students are only exempt from the Research Methods course if they register for an Independent Study with their faculty advisor and the independent study is entered on the student's transcript as Research Methods. Students who take the Research Methods course learn from their peers and from their instructor about the range of research work being undertaken in the Psychology Department. Students who complete a master's degree in psychology at The New School are not automatically advanced into a PhD program. Acceptance to doctoral study requires separate application. Students matriculated in the MA program in the Department of Psychology may apply to continue study toward the PhD in Clinical Psychology or the PhD in Cognitive, Social, and Developmental Psychology as soon as they have registered for 30 credits.